Hey there Barista at the local McCafe. As I sit here listening to “Blank Space” by Taylor Swift, I can’t help but remember how pathetically I grinned as I looked away when I saw you come up to the counter to serve a few customers who came before me. I came out from a 2-10pm shift at the Hospital right across the street, and I just had a rough ending to my shift. Not that the staff I work with were any mean, they’re actually the opposite: calm, assertive, helpful–and if anything, if they’re even the slightest bit annoyed with my performance as a Nurse Trainee, I couldn’t catch a glimpse of it the whole time. Ah, well, there’s no room to sulk or be sad about one thing or blame people. I learned so much today. But despite how nicely the shift ended, I couldn’t help but think, with the so many things I couldn’t get right during my shift, what if they’re already talking about me behind my back and saying things like, “She’s so slow.” or “She’s such a pathetic excuse for a Nurse.” I mean, there’s so much ‘hate’ and negativity I’m expecting, but they’re really really nice people, and I walked down the stairs with watery eyes praising God and being emotional–almost crying, not because of the many mistakes I’ve done, but because of how nice they are to me. God bless them nice people. I love them so much already. But why, you ask, am I telling you this–oh you, who happen to see this blog that I meant to write for you (assuming that you are reading this)? Because, as I came out from my shift, and even before my shift ended, I was already kind of set to get that Strawberry Smoothie. My heart was heavy, though it would’ve been heavier if, in fact, the staff got mad at me. As a nurse, I care for my patients, and it is my duty and responsibility to put them first. With anything that happens, I put accuracy and safety towards them first rather than my own pride and reputation, so that, so help me God, I hope I learn quickly along the way. 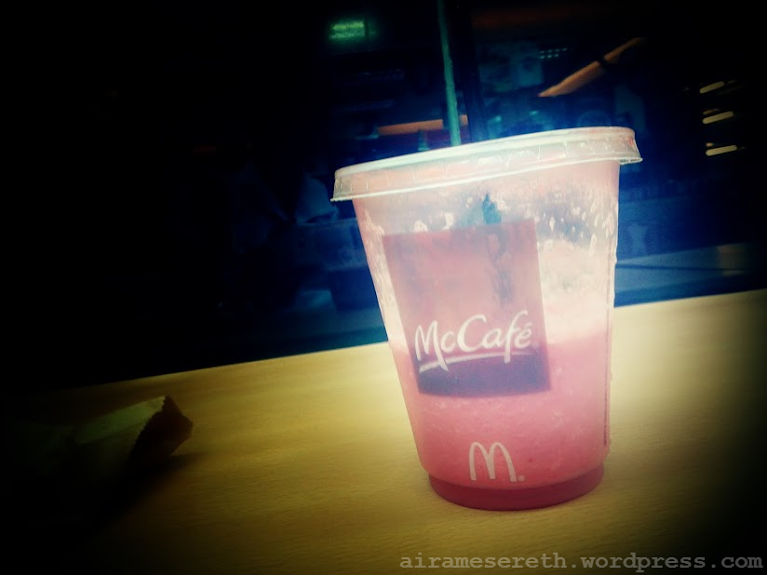 And as I crossed the busy night road, building up on traffic despite it being about an hour left before midnight, the street dark still because of evident lack of street lights in the area, I stumble into McDonalds and went straight to the McCafe counter, eyeing the menu without a second thought–I deserved that smoothie. No caffeine tonight. Although I expect the sugar rush to keep me up for a while after midnight, the caffeine would be a load on anxiety attacks right after the shift I had. And at the counter, I saw you–you in your black McCafe uniform, with a smile almost enchanting. You smiled at the customer before me, as you took their orders. I look away abruptly to halt any impending unforeseen cheek muscle movement. But I couldn’t help asking if the smoothies were available, as you informed one customer that hot drinks are not available. And you said of course. So, I ordered my Strawberry Smoothie. Ah, and you hadn’t given me my change immediately. And you asked me to take a seat as I wait. As I stepped back to find myself a seat, and you to serve up waiting orders, I mouthed a silent “Ang gwapo niya” with a pathetic grin on my face. And I stopped suddenly, to simply check if anyone was looking–or if the girlfriend was somewhere in sight. Us women, we just know if the girlfriend is within shooting distance. Ah, but the man who seemingly smiled in my direction just happened to be on the phone with someone and not smiling because he had realize I was crushing on you. You serve the smoothie in a brown paper bag, as requested “for takeout.” But you say you’ll be right back with the change. A good thing you remind me because I was literally about to leave–about to excuse myself before I start smiling, laughing, giggling or daydreaming about you. You come back with the change: seventy-five pesos, I recall. Your fingers brushed mine as you gave it. And I had the most ridiculous idea. Though, to be honest, I wasn’t pleased that you had put in the paper bag with the drink only a single tissue napkin. Before you even came back with the change, I became fond of the tissue napkin I snuck into one of my front pockets, all because of the nicely looking logo it bore on one corner. And as I waited, I thought of how lucky your girlfriend or wife or kid is, or if you were probably part-timing there to help pay for University, or if you were a graduate in that specific course–as a barrista of some sort (but why work at McDonald’s?). That wraps up my day. How did your day go, Mr. Barrista? I simply want you to know you made my day end sunny-side up, and I wish you well, both you and whoever you’re with this Christmas. I don’t celebrate Christmas, fortunately, so don’t be threatened. Haha.